put strawberries in the blue bowl because the color combination makes me happy. 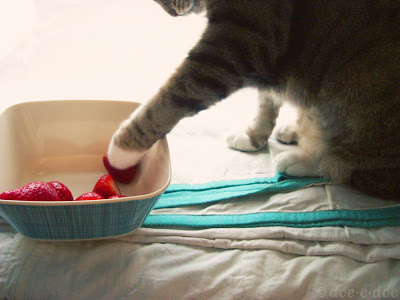 I love silly kitties who stick their paws into bowls full of strawberries! I love kitties with little white feet! Cats are such goofs! Love it! It looks like it makes someone else happy too! there is nothing cuter than a cat! my cat ran through the room with a styrofoam cup that i brought home yesterday... then chewed and clawed it up and left little white bits all over the house. somehow i still thought it was adorable! that reminds me of this adorable pattern i found a long time ago and always intented to stitch up.. I can totally relate, I just LOVE red and aqua/light blue together! I'd be thrilled if you would drop by my international blog linking party every Sunday (thru Tues) and link to something you've created lately and a free pattern. Hope to see you there @creativejewishmom.com all the best! Yep that's one of my fave colour combos too. Great colour combo - but the puddy cat wins the day! When I make strawberry shortcake for a crowd, the strawberries go in the blue, the whipped cream in the purple and the little cakes go in the green. Though your blue bowl is much prettier than mine. awww...you guys are all so sweet to leave me such nice comments & compliment my little kitty girl - thank you so much! !